You are here: Home / Have Metals and Stocks Bottomed Yet? 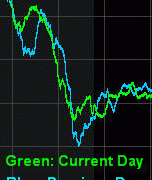 / Daily Market Trades / Have Metals and Stocks Bottomed Yet? Have Metals and Stocks Bottomed Yet? 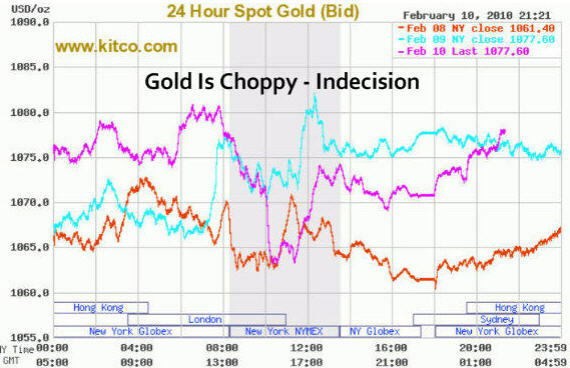 Everyone is wondering if gold, silver and the indexes have bottomed after last week’s heavy selling. To put things into perspective there were over 30 sell orders for every 1 buy order at the NYSE. That is pure panic and to confirm extreme fear, several of my broker buddies said last week was crazy with clients demanding to liquidate their positions ASAP to be 100% in cash. This type of sentiment and price movement warns us of a possible market bottom. I am getting the feeling that traders and investors have been expecting this sharp drop I don’t see or feel a large amount of fear in the marketplace. Last Thursday and Friday war crazy but I think we need one more drop to really shake things up before a bottom is set. 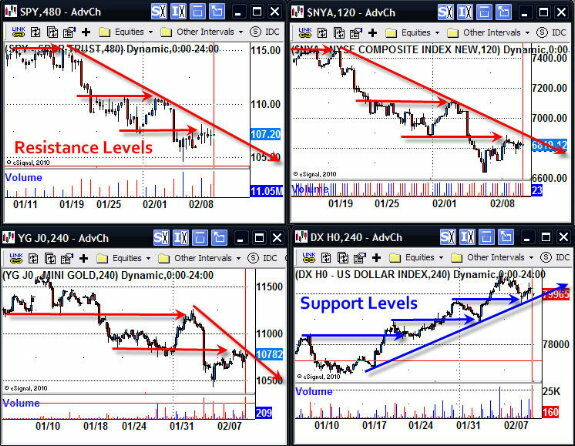 Below are some charts showing where the market currently stands and what the charts are pointing to. Gold is clearly trending down on the daily chart. One more thrust down should shake things up enough to trigger the next rally. 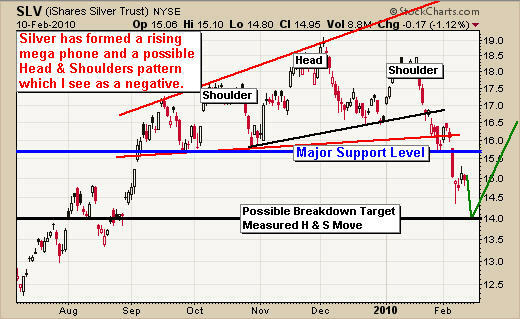 Silver has formed a Head & Shoulders pattern and has broken through multiple support levels. A measured move to the down side would be $14 for silver which could happen in the coming days. These charts clearly show the price action of the past month. 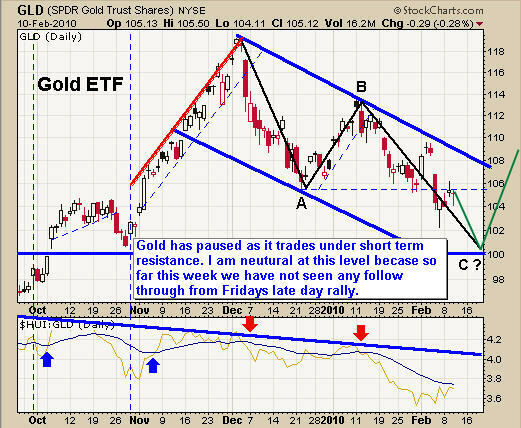 As you can see the trend of stocks and gold are down with consolidations (pauses). This is the exact reason why you must trade with the trend and not do counter trend trades. Bounces are more like sideway movements making it very difficult to try and play bounces in a down trend. If you focus on selling at key resistance levels then moves tend to be much more profitable. That being said, we did go long last Friday because of the extreme oversold market level. I was expecting a follow through Monday or Tuesday which has yet to happen. We have now moved our stops to break even or better to eliminate our down side risk. This chart says it all. 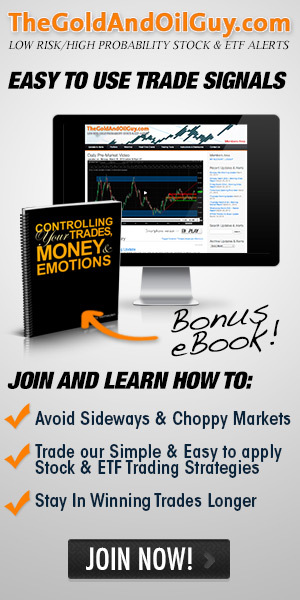 The market and gold is very volatile making it difficult to trade right now. Bulls and bears are battling it out. Only time will tell! In short, it’s been a slow week without any real exciting moves. 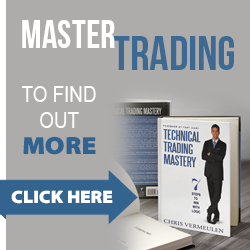 Thursday and Friday could be interesting if traders exit their positions going into the long weekend in order to protect themselves from any surprise economic news. From the looks of gold, silver and the indexes I sense selling could be just around the corner. We are currently long a few positions with our stops are break even or better in hopes for a pop and rally going into the holiday weekend but only time will tell. My wife and I have our first child due on Saturday so I may disappear for 1-2 days in the coming week as we welcome our little princess into this new and exciting world. http://www.thegoldandoilguy.com/wp-content/uploads/2014/11/tgaoglogo.png 0 0 admin http://www.thegoldandoilguy.com/wp-content/uploads/2014/11/tgaoglogo.png admin2010-02-10 22:46:232014-03-10 10:03:03Have Metals and Stocks Bottomed Yet?